Sunday evenings at our house is often a very simple meal of cheese, crackers, apple slices and wine. 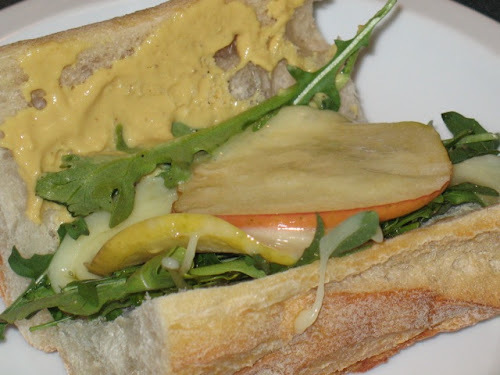 Because I had some leftover baguette recently, I decided to turn up the volume a bit and make a sandwich--a vegetarian sandwich no less (a nice contrast to all these burgers). This is pretty simple: slice the baguette open in half, leaving one edge of the crust connected to hold it together. Spread honey on one side and dijon mustard on the other. Place a few arugula leaves in the middle. Place two thin slices of apple in a medium frying pan over medium-low heat. Top each apple slice with a slice of cheddar cheese. Heat about 10 minutes until the apple softens and the cheese melts. Use a spatula to transfer the apples and cheese to the middle of the sandwich. Pass the pepper grinder over the top, if desired. Thanks! It would make a good breakfast.